Tomorrrow is the end of the World! 21st of May 2011….. yeah right… another religious prediction in order to scare more gullible people into a churches flock in my opinion. 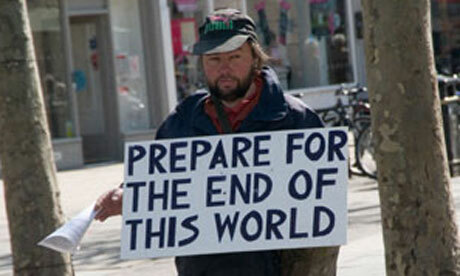 Camping believes the rapture will occur May 21 and that God will destroy the earth on October 21. Yeah right! THE END OF THE WORLD AS WE KNOW IT! !